Summer greetings all, my festival shoes are allready destroyed. Looking forward seeing you in the Netherlands at Awake 2015, Welcome To The Future and in Budapest at the GWD. And theres more land ahoy! This summers tourdates also include Athens, London, Gent, Honduras (Sunjam) and several dates in Colombia. Until then - Peek-a-boo my new and upcoming release plus mixtape below. For the true and experienced lovers of authentic Techno sound architecture, this record does not need much presentation. 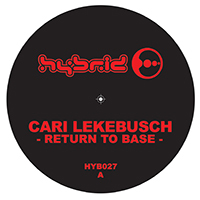 Cari Lekebusch has since the beginning of the 1990's been releasing a steady stream of vinyl records as well as all types of digital formats. Since 1986 the personal label project of Cari has been going through many phases of change. One of them being the ending of the HYB catalog numbered vinyl releases, and the beginning of the HP and HPX catalogs. To mark a reset and a "return to base", Cari is morphing the grid once again and will now continue the HYB catalog that shifted into the HP and HPX catalogs around 1997. The retro sounding audio-pictures of "Return To Base 1 & 2" are intentionally created with the various H-Productions releases in mind, that came out around 1993-1997. Both tracks are created with a cool, stripped down approach and recorded live with only what 2 hands can muster at once. Live and direct from the hybrid productions headquarters!